A superior non-staining joinery, end grain sealer and buffing wax. Use alone or as a finish coat on any woodwork for added sheen and protection. Also refurbishes dry, dull logs, timbers, or anything made of wood. Apply one of two ways: rub in as a polish and buff dry, or apply, let dry, and polish with a power buffer. This product is excellent for periodic maintenance and cleaning of timber frames. For joinery or end grain, simply paint on Liquid Wax before long-term storage to reduce checking or just before putting piece into place for easier fitting and extra protection. 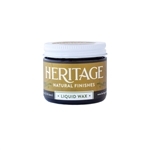 Our Liquid Wax End Sealer is used often by timber framers in the shop for sealing the end grain and joints of large timbers for deep oil penetration to reduce checking without the danger of staining the wood. It is great for any raw log ends sitting in the log yard, or any timber end grain exposed to the weather. This formula also makes the wax much more durable for a top coat and is recommended for top-coating in floor finishing, counter-tops, and a final coat on an earthen floor and for general furniture finishing. Coverage: Approx. 800 + square feet per gallon; rough-sawn materials tend to absorb more. You get less coverage on the first coat and more on the second. The density of the wood is also a factor. Softer woods like pine or reclaimed Doug. Fir will absorb more than oak for example. And obviously dry wood will soak up a lot more oil than green timbers. You may want to over-estimate when ordering.The finish keeps indefinitely when stored properly with minimal air exposure. A 2 oz. glass jar sample with wide mouth metal screw top lid. Our richest product we make! Our Liquid Wax End Sealer is a great joinery/end grain sealer and a beautiful, lasting buffing wax for a variety of surfaces. Packaged in a one quart, epoxy phenolic lined paint can with lid locks. 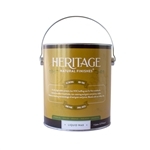 The Liquid Wax finish comes in a one-gallon epoxy lined metal paint-style can with handle and lid lock ring. Packaged in a 3 gallon epoxy-lined steel pail with steel removable lid. $102/gal. 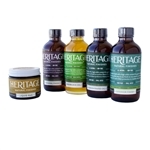 Packaged in a 5 gallon epoxy-lined steel pail with pour spout in the removable lid. $103.60/gal. 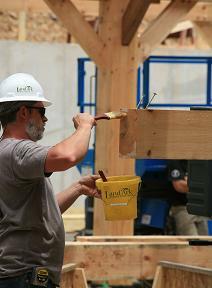 Photo: Applying our Liquid Wax End Sealer to the John C. Campbell Folk School's new timber frame blacksmith shop (Brasstown, NC). An application of Liquid Wax to joint ends and joinery cuts, help reduce shrinkage and cracking, as well as helping ease the timbers into position during construction. Photo by Autumn Peterson, Heritage Natural Finishes, LLC.